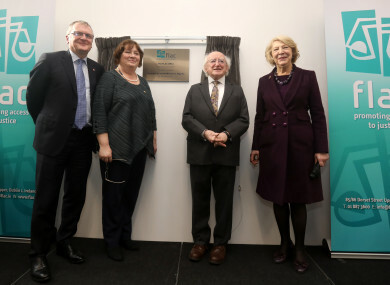 L TO R. FLAC chairperson, Peter Ward SC, FLAC chief executive, Eilis Barry with President of Ireland Michael D Higgins and his wife Sabina as he officially open the new FLAC office in Dublin. PRESIDENT MICHAEL D Higgins has said that Ireland should not be satisfied with its current system of justice which is dependent on the ability to pay for it. Speaking at the official opening of Free Legal Advice Centres’ (Flac) new office in Dublin, Higgins said that effective access to justice is a basic human right arguing that access to legal aid is a crucial requirement of that. “A nation that aspires towards true equality, could not be satisfied with a system of justice that is reliant on the earning power of those who seek to access it, or accept a situation where those who cannot afford to pay for justice can be more easily deprived of their liberty, or for a view that a fair trial is a commodity is a right limited to one’s capacity to purchase it,” he said. There can be no doubt that those who are most vulnerable and marginalised in our society are also those citizens who are most at risk of encountering legal difficulties and most in need of a justice system that is accessible and that operates in the best interests of all. Flac was established in 1969 by four students who wanted to use their skills and knowledge to provide legal advice to those who could not afford to pay for it – an organisation Higgins says has contributed “so much to the achievement of a rights-based legal system in Ireland”. Speaking at the opening of Flac’s new office, the first in a series of events to mark its 50th anniversary, Flac’s chief executive, Eilis Barry, said that five decades later, justice continues to be unattainable for some groups in society. Last year Flac dealt with over 25,000 requests for legal information and advice to its telephone information line and advice clinics. It recently urged the government to make free legal aid available in proceedings involving the repossession of a home. “It is simply not acceptable, in a state that claims to be a democracy, that the most vulnerable section of our society is unable to access our legal system or is prevented from doing so in a timely manner. That is a situation which damages the very fabric of our society, entrenching and exacerbating inequality,” Higgins said. The homeless, the poor, those with a disability or who suffer from mental illness, immigrants, lone parents and those living or growing up in disadvantaged communities encounter many more legal problems than the rest of our population. Higgins added that when vulnerable citizens are abandoned to navigate a complex legal system alone, they are experiencing a grave injustice. “It is, indeed, worrying to know that figures released last year by the Irish Penal Reform Trust to the Oireachtas Education Committee showed that the majority of those currently in Irish prisons have never sat a State exam, with over half having left school before the age of 15. “It is also revealing that prisoners in Ireland are 25 times more likely to come from deprived communities, indicating a very clear link between social disadvantage and crime and punishment,” he said. FLAC’s new premises on Upper Dorset Street has a special historical significance as the playwright Sean O’Casey was born on the original site in 1880. O’Casey’s daughter, Shivaun, was in attendance today for the opening. Email “'Damaging to the very fabric of our society': Higgins criticises Ireland's unequal justice system ”. Feedback on “'Damaging to the very fabric of our society': Higgins criticises Ireland's unequal justice system ”.